also a nice portable size, nice and neat to move around. Great way to store and transport the full nintendo switch system around! Switch console with joycons, pro controller, grip, adapter, HDMI cable, joycon skins, cards not included. HOLD EVERYTHING CARRY ALL -- The large switch system storage case for nintendo switch can hold your entire switch console and accessories. The switch case's cutout slots can hold 1 switch console with joycons, 1 switch dock, 1 joycon charging grip, 1 adapter and 1 pro controller for nintendo switch. Also you can put extra HDMI cables, joycons, joycon straps, joycon skins, games cards etc for nintendo switch in the cutout, mesh pockets, games micro sd cards holders. CONVENIENT TO USE, SPACIOUS -- The switch case for nintendo switch is easy to carry with the comfortable handle strap and crossbody strap. The outer two zippers are easy to glide from 2 directions even if tens of thousands of uses. The switch case outside is small, inside is spacious for your entire switch system. It is also a nice portable size. 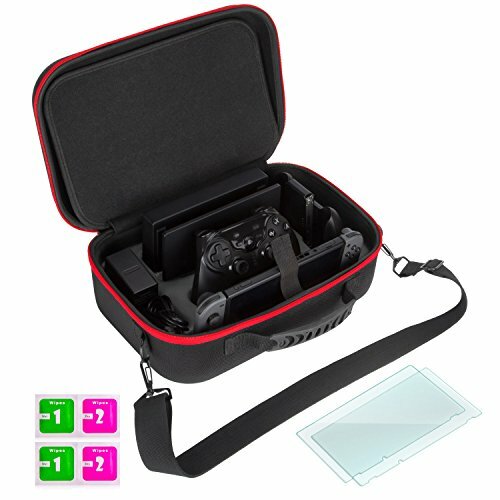 HARD SHELL AND SOFT PAD PROTECTION -- Our switch case is a must-have for any switch owner.The travler carrying switch case for nintendo switch outside is a hard shell and the inside is a soft pad. The switch system case's ergonomic cutout and pockets fit all your switch bundle and all accessories in it snuggly and neatly, which do not bounce around inside, even if the switch case is moving around long terms or flipped upside down. GREAT BONUS SCREEN PROTECTORS AND WIPES -- The 2 packs tempered glass screen protectors are disigned for nintendo switch. Ultra-clear, high definition with 99.9% transparency to allow an optical, natural viewing experience. Ultra thin thickness is reliable and resilient, and promises full compatibility with touchscreen sensitivity. Highly durable, scratch resistant, surface hardness 9H and topped with oleophobic coating to reduce fingerprints. 100% MONEY BACK GUARANTEE -- Our premium quality switch case for nintendo switch is backed with 100% money back guarantee. Within 24 months We offer free replacement or full refund if you are not fully satisfied with our big switch case. If you have any questions, please do not hesitate to contact us by email, we will settle your question within 12 hours. If you have any questions about this product by Menkar, contact us by completing and submitting the form below. If you are looking for a specif part number, please include it with your message.